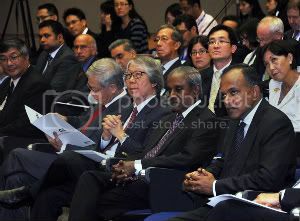 K Shanmugam is Singapore’s Minister of Law. This article is the editorial of the Nov/Dec 2009 edition of PETIR. The PAP has become one of the most successful political parties in history. But even as we acknowledge its exceptional success it is necessary to be mindful of another powerful lesson from history: In the modern era, no party has succeeded in staying in power continuously for more than seven decades. In democracies which came into existence in the 20th century, this pattern has repeated itself: Parties sweep into power, filled with idealism. But the zeal fades over time, the trappings of power corrupt, there is a reluctance to renew within the party and inevitably, the electorate seeks a change. The PAP has so far avoided these pitfalls and kept the people’s trust. It has continuously delivered economic well-being; stability, safety and security; a corruption-free government; and equality of opportunities. It has also been very focused on two other interconnected factors – regular change of leadership and the induction of talent. Unlike almost any other political party, it has a very thorough self-renewal process, which is devoid of sentimentality, and has regularly brought about change of MPs and ministers. The Party has also done well on talent induction. Parties atrophy when they do not bring in talent. That talent then often goes to the opposition. The PAP has actively sought to absorb available talent. Those who are prepared to go into politics are brought into the Party. The rest are co-opted in one way or another into government and other organisations that contribute to the well-being of society. One could conclude that as long as the PAP stays true to its principles and delivers progress, it should remain the dominant political force. But that conclusion is not so clear cut. One factor which may potentially weaken its appeal is its ability to communicate its fundamental message to a younger electorate. Why would communication be a challenge now? One reason lies in the PAP’s framework and DNA. It understands how vulnerable Singapore is in many respects – size, geographical situation, racial makeup, regional political, economic, military and social situations. There is a deep belief that Singapore’s very existence is always at risk. That Singapore needs to react very quickly to changing external environments, and has to keep its economy highly competitive. Thus Singapore, more than most states, needs an excellent, strong leadership, and its political structures and systems must allow for effective and speedy decision making. Based on this, the Party’s message has been: Singapore needs good governance and only the PAP can deliver it. That message resonated strongly with an electorate that experienced the turmoil before the 1970s and the concrete progress the PAP delivered. But the collective memory of this is not as strong among newer generations, whose viewpoints will increasingly influence the political process. They have grown up with stability, safety and security. About 75 per cent of each cohort gets some form of tertiary education. They are therefore confident, and often with clear ideas of what the political process and system should be like in a democratic state. These ideas are based on the dominant political philosophy today – the Western model of liberal democracy is superior. There are many aspects of the model which several countries, including Singapore, have sought to adopt. But not every aspect can be transplanted in toto across cultures, without regard to different economic, social and geo-strategic situations. However, that is not a commonly expressed view. Instead, countries are judged only on whether their norms fit that “gold standard”. One possible impact of this is that young Singaporeans may believe that all the model’s norms can be adopted, without tradeoffs. The Singapore model of democracy, for example, has delivered stability and rapid progress. Is it possible to change that model, without any trade-offs? Singaporeans are entitled to decide whether they want the trade-offs. And if the majority chooses slower development and a lower quality of life, and is willing to accept more tensions within our society in return for changes in the political system, then so be it. But that choice must be an informed choice. The risk is that Singapore has been so successful in dealing with its vulnerabilities that many may not now fully realise that these vulnerabilities will always have to be dealt with. So, as we become more and more like a first world city, the younger electorate may find it difficult to accept the PAP’s basic message – that Singapore is unique, and the liberal democratic model has to be adapted considerably to work for us. It is therefore fundamental to get Singaporeans to understand the costs and benefits of different political systems; the factors which have made Singapore successful; and the costs and benefits of changing our system. How do we ensure this? The answer lies with our education system. This focuses on equipping our students for today’s internationalised economy. But it does not educate them enough on political systems, philosophies or histories of societies. Our students do not get a clear perspective on our vulnerabilities and the consequences if those are not managed. There is considerable scope for education in these areas. Our experiences can also be contrasted with those of other post-colonial independent states. The education should not trumpet the virtues of any particular system. Instead, students should be taught how political systems work in different cultures, why some societies succeed and others fail, and the impact of climate, geography, size, ethnic make-up and strategic situation. The history of city states and how they have waxed and waned would also be useful. That will make people look carefully at the liberal democratic model and help them decide which aspects best suit Singapore. And the PAP’s message, which is based on the serious realities of Singapore, can continue to resonate with the electorate.